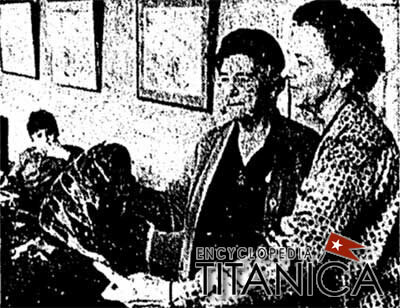 Mrs. Jacques Futrelle (left), Scituate, survivor of Titanic sinking and Charlotte Dempsey, director, Children’s Arts Center, look at children’s work after hearing Mrs. Futrelle describe the sea disaster. The sinking of the S.S. Titanic 49 years ago was vividly recreated in paint and crayon yesterday by a group of young artists at the Children’s Art Center, 36 Rutland st. South End. Mrs. Futrelle was one of the few survivors of the tragedy which took place Apr. 13 and Apr. 14, 1912 when the luxury liner was on its maiden voyage from England to America. The children sat in awed interest as Mrs. Futrelle told of the sinking and her parting aboard the sinking ship with her husband, a famous writer, who died in the disaster. When Mrs. Futrelle finished her story, the youngsters went to work with crayons and paints to create the images that had been evoked in their minds. This type of artistic exercise is often held at the center under direction of Charlotte A. Dempsey, director. “It’s a great method for stimulating young imaginations,” Miss Dempsey said.